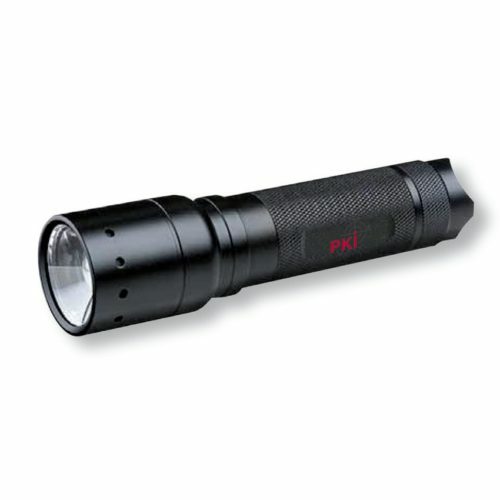 PKI 9545 is a rugged torch light with glass breaker, stroboscope and SOS function. This LED torchlight offers electronically controlled and constant light intensity or continuously decreasing brightness and thereby longer operation time. In case of emergency it can also be used to break a window pane by means of its integrated glass breaker. Furthermore help can be brought by its SOS function. The high frequency light flashes of the stroboscope function provide quick and efficient possibilities for defence. Basing on high technology micro controller this torch light offers individual light programs. The power consumption is optimized by intelligent software. Comes with hand strap, clip and batteries.